On 6 and 7 juin 2017, five members of the Network for integrity, i.e. the Comission for the resolution of conflicts of interests of Croatia, the High Authority for transparency in public life in France, the Civil service bureau of Georgie, the National agency for integrity from Romania and the National agency for corruption prevention in Ukraine, met in Tbilisi in the framework of a conference that was co-organized by the Civil service bureau on implementing and assessing the impact of systems of assets and interests disclosure for public officials. This conference was organized with the support of the Regional anticorruption initiative, the anticorruption division of the Organization of economic cooperation and development and the United Nations development program. These two days were articulated along the axes of the report on the subject of the OECD, to be published in 2018, and notably allowed the five member institutions of the Network to present their experience in terms of creation of such system, of implementation but also of control and sanctions. 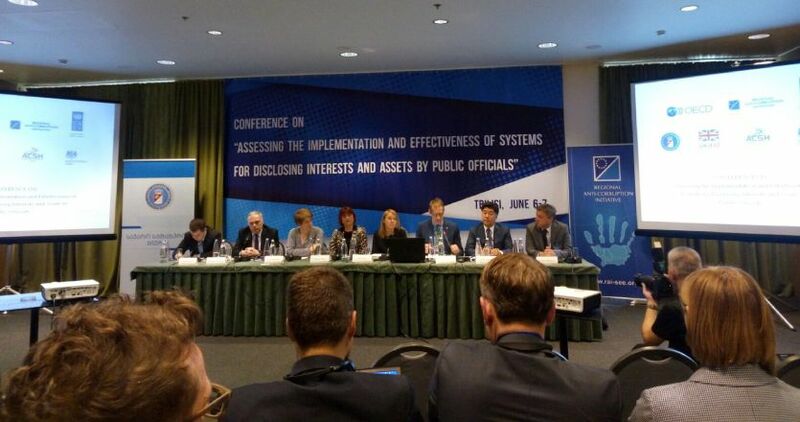 The discussions allowed to highlight common challenges that agencies and institutions tasked with collecting and/or controlling declarations of assets and interests are confronted with, whether in France, Portugal, Latvia, Slovenia, Romania, Kosovo, or Indonesia, Armenia and Bulgaria for instance. Despite different politico-institutional contexts, all highlighted challenges they met in implementing their system, whether they were technical, interinstitutional or political. Nonetheless numerous initiatives and reforms have been witnessed over the past decade and the debates highlighted the importance of such topics in the public sphere more broadly speaking. The representatives of the five member institutions took this opportunity to discuss their expectations with regard to the first meeting to be organized by the Network and the soon-coming entry into force of the founding Charter, as of 1 July 2017. The information systems and means to collect data and information as well as internal applications needed in the framework of the daily implementation of the missions of these institutions appear as major challenges that could be explored in future activities.